“Middle-ring” relationships have receded in the new social patterns of American life. We need imaginative Christian leaders to develop institutions that can support and sustain the community we now lack. A large-church pastor is worried about the health of his church. Small groups seem to be working fine, and the overall worship is fine. What is missing, though, is the sense that the congregation is a community capable of moral and spiritual formation. The pastor’s worry reflects far more than the circumstances of one congregation, or even of congregational life more generally. It reflects the disappearance of the crucial “middle rings” that are central to healthy communities that nurture and sustain vibrant personal life. Middle rings are what Marc J. Dunkelman describes in his book “The Vanishing Neighbor” as the heart of community in American life. Inner rings describe our most intimate relationships, with families and close friends; outer rings describe casual acquaintances. Middle-ring relationships are the people with whom a person “is familiar but not intimate, friendly but not close.” They are central to fostering a sense of vitality as well as nurturing those “meaningful disagreements” that shape a healthy body politic. Typically, this middle ring comprises no more than 150 people, because of the limits of our brains. For much of American history, our middle-ring relationships have been formed through a “townshipped” model. This was as true for congregations as it was for our broader civic ecology. Dunkelman notes, though, that profound changes in American life have transformed the ways we navigate and imagine the rings of our lives. 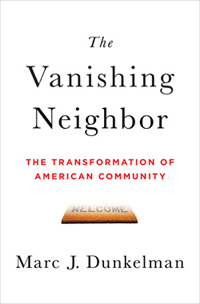 Dunkelman highlights three broad categories of changes that are upending American community: the technological and economic revolutions of the last 60 years, the explosion in American mobility and the evolution of our lives at home. These changes have affected the inner and outer rings, in many ways actually enhancing them. For example, social mobility has made people more reliant on intimate relationships, whether family members or close friends. Indeed, studies of cellphone usage show that the majority of our calls are to three to five people in our most intimate, inner rings. The digital revolution makes it easier for us to maintain connections to casual acquaintances in our outer ring of relationships. It also makes it easier for us to establish new acquaintances through affinity groups and to connect even more broadly via social media. These outer-ring relationships can mobilize significant movements, such as the tea party on the right or the Occupy movement on the left. Yet Dunkelman argues that such movements are not capable of addressing our yearning for the sustainable community found in middle-ring relationships. Those relationships have receded in the new social patterns of American life, leaving us feeling fragmented and isolated, even with healthy inner- and outer-ring relationships. We are missing a sense of community; in Dunkelman’s memorable image, the middle rings have become missing rings. The danger in such a diagnosis is to become nostalgic and wistful, longing for “the good old days” of townships and community. But there is nothing that accounts for a longing for the good old days quite as much as a bad memory. Those forms of community were far from perfect, and wistfulness is likely to lead us to imagine a time that never was. Nostalgia for “townships” would be as counterproductive as it would be ineffective. But it would be equally dangerous to ignore the challenges we face or to assume that we can adequately address those challenges through inner- or outer-ring relationships. The large-church pastor rightly senses that something is missing in the congregation he serves. Young adults also rightly sense that current institutions are failing them and us, and that new patterns are needed. But we are unsure what to do next. A transformation of American community has come to affect everything from our propensity to innovate to our capacity to care for one another. It has disrupted our social institutions as much as it’s thrown a wrench into our politics. Without notice, a quiet revolution over the course of several decades upended the foundation that girded the very pillars -- government, businesses, banks, schools -- in which the public has lost faith. Its effects, which explain nearly every frustration listed above, run deep and wide. Can we chart a future that is adaptive to the deep trends of our culture and nurtures middle-ring relationships? Charting such a future will be challenging. As Dunkelman notes, we need to be honest with ourselves: “Simply reinforcing flailing institutions that have worked for decades, or tinkering at reforms around the edges, won’t fix our problems.” Those institutions aren’t working anymore in the ways we need them to. We will need the fresh imaginations of leaders of Christian institutions, and Christian leaders of institutions, in order to map out such a plan. Nurturing such imaginations will require clear-eyed diagnoses like Dunkelman’s, as well as the cultivation of “border crossing” relationships across sectors and across other divides among us. And here senior pastors might be exceptionally well-positioned to provide vision and leadership -- IF we embrace the realities of a networked society AND offer a “traditioned innovation” approach to community and institutions. Congregations and other forms of Christian community can and should gather people across divides, focus on forming relationships that bear witness to the fullness of God’s reign, and embrace issues across sectors and institutions that, sadly, currently exist more as silos than as networks (including the church). The Fresh Expressions movement is one example of a Christian experiment that is helping to renew middle-ring relationships. Some of these fresh expressions have emerged out of larger congregations, addressing the gap between intimate small groups and the rather anonymous outer ring of the whole congregation; other fresh expressions are entrepreneurial startups in which hybrid forms of face-to-face and online gatherings connect people to each other in new ways. And yet others are crossing boundaries to work across sectors to serve and renew neighborhoods, especially in underserved areas. Diagnosing our challenges without lapsing into nostalgia is critical, as is recognizing that we do not currently have the institutions we need to support and sustain middle-ring community. As we sow seeds of new and renewed forms of community through creative experiments and transformed imagination, let us also develop and renew institutions so those seeds will grow into full blossom.